There have been tougher games to win for the Bulls against the Miami Heat than Monday night in Game 1 of the Eastern Conference semifinals. There was the one when the team was late and Benny and the Elevators had to match up with the 1986 Celtics. And there was the time Shaler Halimon and Kennedy McIntosh took on Jerry West and Elgin Baylor. You tend to doubt Thibodeau less the way the shorthanded Bulls endured in the seventh game to defeat the Brooklyn Nets in the first round of the playoffs. But this is the Miami Heat, the team with the league’s best record, the defending champions, on a streak of 41 wins in their last 43 games, having been resting for more than a week since sweeping the Milwaukee Bucks in the first round of the playoffs and with LeBron James getting his MVP award in the expectant likely throbbing arena before Game 1 begins. Oh, there’s Luol Deng still back in Chicago with the after effects of his virus and spinal tap over meningitis fears. But Deng’s not in Miami and Thibodeau didn’t say he would be for Game 2 Wednesday. It hardly sounded given the circumstances he’d be in any shape to play in Game 2 in any event. Plus, Kirk Hinrich was listed as a game time decision with his serious calf injury, though that sounded more like a pause to the Heat as it would be surprising to see Hinrich playing in Game 1 given his limited movement. And so Jimmy Butler, say hello to the MVP. You’re not likely to be defending anyone else. Though Thibodeau said he was uncertain about his starting lineup, it seemed likely he’d go the same way as against Brooklyn with Nate Robinson at point guard and Marco Belinelli at shooting guard. It’s a better matchup for Robinson with Mario Chalmers while Belinelli gets Dwyane Wade, who has had his own knee issues but considerable time to rehabilitate the past week. “Lu is a very important part of the team, sort of the glue of our team,” said Thibodeau. “That being said, he has missed games during the series. He missed games in the last series (and they won). “Actually it’s been three years (of injuries), “Thibodeau said when asked about the Bulls accustomed to all this. 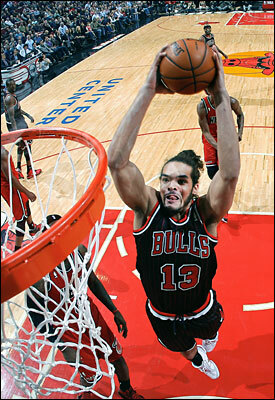 “The first year (2010-11) Joakim missed three months of the season. That’s the nature of the league. You’re always dealing with injuries and it’s how quickly you adapt to changes. We went into the season with the understanding Derrick would miss a good chunk of the season. We knew from the start you don’t replace him individually but collectively. As for Rose, he faced the new, growing media contingent with the advance to the second round. He didn’t say anything different than he has in any of his comments since February, that he’s hopeful about playing, has support from the team and his teammates, is working hard and is positive. There’s just a new group of people in to parse the comments. Rose said he understands the interest and has no issue with the constant questioning of his decision. Try that with Deron Williams or Kobe Bryant. Or most any of those guys. “People want to know where I’m at,” he said as he constantly maintains a patient and understanding approach with media despite the occasional accusatory tone. “So I want to give them an answer. Everybody has their own opinion. The key word is if I’m ready. Right now I’m not ready. So I’m just trying to take my time and really, really be smart. It’s definitely hard but I know that this will be over with pretty soon. Who knows when it’s going to stop but I can’t just get down on myself. Rose said he’s been occupying himself with movies and watched the latest Bruce Willis Die Hard twice in his hotel room Sunday. He said he’s also listening to music on his computer and is up for another Willis sequel. “We’re definitely going to miss (Deng) tonight, but we always prepare where someone has to come in and do a job,” Rose said. “We just worry about right now. I feel we have nice shot. I think our chemistry has come along good on both ends of the floor and we’re playing good basketball.